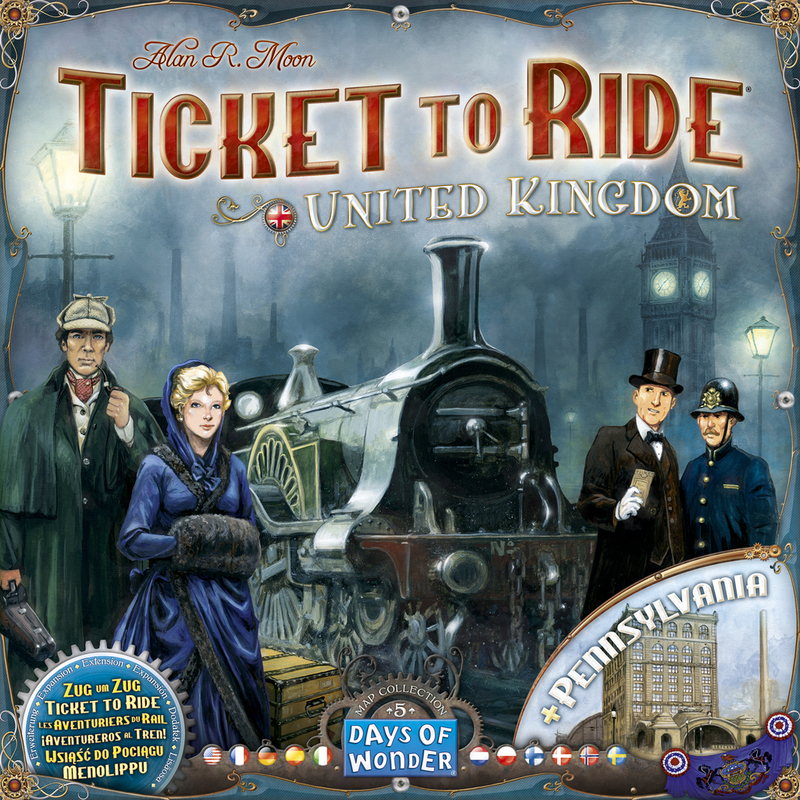 After the TTR for the British Isles, the map was flipped, some of the players stayed and some were replaced, and TTR Pennsylvania was revealed. This time is was James, Peter, Jon and Paul that took on the different challenge of building routes while collecting shares for the various Penn railway companies in the golden age of the industrial iron horse. Routes between the industrial cities of the American North east were up for grabs. Most route segments on the board reward the claimant with a share in one of the railroad companies. Each company has a different number of shares and a decreasing reward for the shareholders with the most, second most, third most shares and so on. 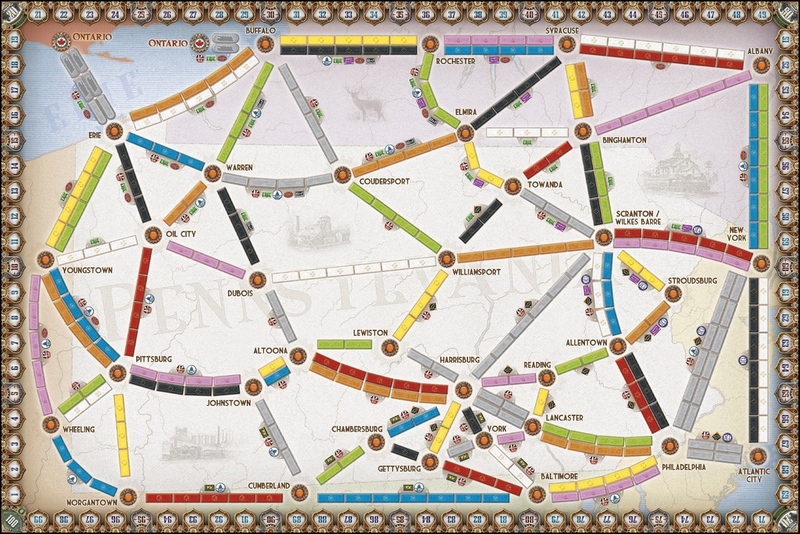 This variant is similar in concept to Santa Fe rails or Chicago Express, but is all within the Ticket to Ride system - how neat. 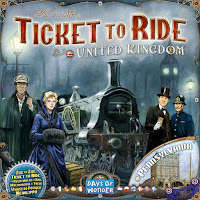 Peter commented that it 'felt more like Ticket to Ride' that the British Isles version, which apparently had felt like a whole different game. Jon set about monopolising the south of the board which has many more little routes, hence more opportunities for collecting shares, but of course which collect fewer 'in game' points. 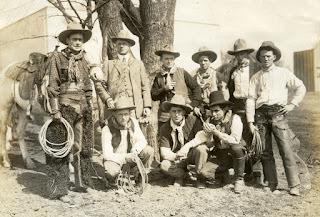 He soon found himself slugging it out for the biggest share company with the most points, the Pennsylvania Railroad, with Peter. Peter also took a set of new routes, 4 in total, and caused the other players to draw breath when he decided to keep them all. Paul was going for the longer routes of the north, which yielded less shares but more points for laying the routes (a la classic TTR). James was also in the North, but with a slightly more watered down 'long route' strategy than Paul. 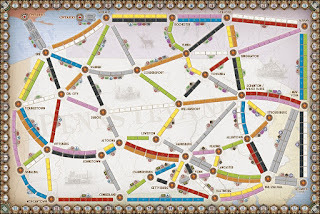 At the end of normal pay, Paul as predictably in the lead because he'd caused the game end by being the first to lay all of his trains and had created many routes with 5 and 6 sections. But would the points from the completed tickets and the share holdings be enough to catch Paul? Peter also gained 15 bonus points from having the most completed routes, but he'd not managed to complete them all and so had some negative scores to contend with. Likewise Jon and James had one or two incomplete tickets, whereas Paul had only four tickets, but they were largely of high value and he'd completed them all. So after the tickets were added up Paul still had his nose ahead, albeit by a smaller margin. Then the shares were added, which were counted up smallest company to largest. Paul's two shares in the Penn RR which enough for third place in the biggest company, gave him enough points to pip Peter in a hard fought battle which saw two different strategies come very close. James was third and Jon was left lamenting his tickets, shorter routes and huge stock in the PRR which maybe wasn't quite worth the money. Apart from the double-up on the new TTR maps there was some miniatures slaying going on at the top table, some crappy birthday gifts handed out, wonky castles (Soren was persuaded that Bezier do have some good games after all), and a successful run in Burgle Bros (with an exceptionally fluky final event card draw that opened up the victory after we had boxed ourselves into a seemingly impossible situation). 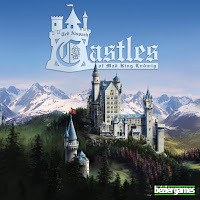 Castles of Ludwig did it's thing as always, with two newbies at the table in David and a rather grumpy "I hate Suburbia" Soren (unless that's how he always is?). The new lads took to the game instatnly and kept pace with myself and Tom, hardy building-site veterans that we are. I tried for a bonus card strategy and had a good run at it but Soren was determined to buy rooms that I needed and had the edge on me in our little competition. He also skillfully leveraged his deep dungeon network to squeeze out every last point that he could, which served him well in a convincing win. Tom came in a close second by working the goal tiles really well while David focussed on activity rooms for a bonus score and a goal tile; four differen't strategies and four very close scores. 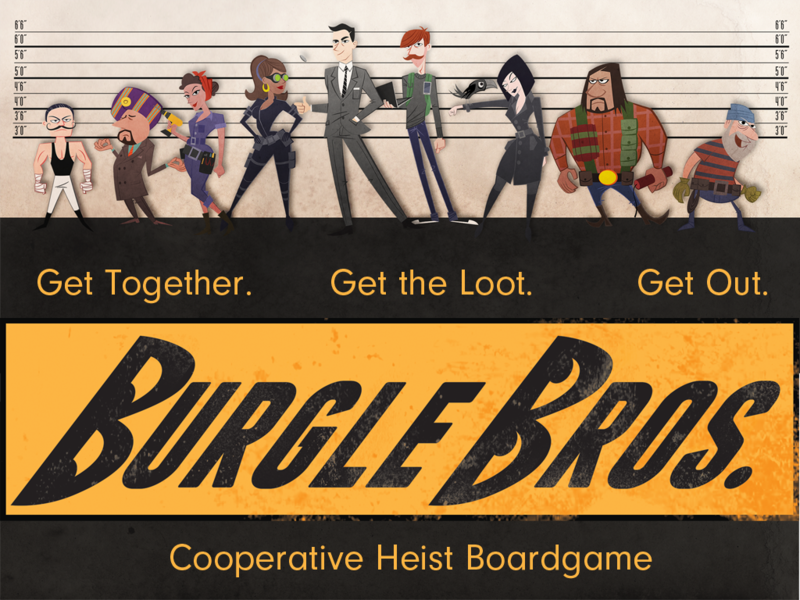 With Tom and Soren disappearing to the far end of the room to play toy soldiers, I set up Burgle Bros. with Alex and James, a game I have been keen to have another tilt at after the recent brain wrangling session the otehr week. This time round I had a clearer idea of what to do and the lads picked it up quickly. We spread out onto three floors so that we could better manipulate the guards as well as slow them down (with less players on a floor it takes longer for the guard to exhaust it's patrol deck). We also made good use of hacking the computer rooms which saved us many times over in alarm rooms. We managed to get all three treasures without too much stress, and Alex made a quick exit as he was hanging out near the rooftop stairs. But then the trouble set in; because both James and I were on our very last 'life' we could not afford to get caught even once. We found ourselves in an awkward situation where the top floor guard was heading toward the entrance to that floor and only one tile away, but the entrance was also blocked on the three other sides. If we went up there then we would get busted one way or the other - cue much wailing and gnashing of teeth. Without any other option I drew the very last event card, wondering if we would find anything that could help us at all - and drew a 'Freight Elevator' card that allowed me to go up to the top floor in a different place. The guard was released from his stasis and cleared out of the way of the exit at the end of my turn, allowing James and then myself to make a quick exit. An awesome finish to a great game!